Pet Friendly Deer Park Riverfront Vacation Condo| Free shuttle to Loon | Recreation Center | Swimming Pond | Sandy Beach | Indoor Pool | Tennis | Close to Lincoln New Hampshire! Great location on the river, easy drive NH attractions and bring your furry friend! 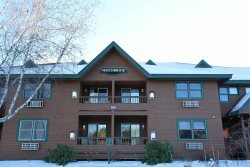 This pet friendly riverfront condo, nestled in the heart of the White Mountains, offers one-level living with three bedrooms and two full bathrooms. The great location by a river provides easy access to nature. It’s an excellent set-up for two families with two queen-sized beds and two bunk beds--sleeps up to six adults or families of eight. The condo includes passes to the Deer Park recreation center just down the road. The center has an indoor pool, a hot tub, a sauna, games, racquetball courts, and more! There’s plenty to do in or around this fabulously located condo. In the winter, get cozy by the fireplace on the large, comfy couch, or have a fun day of skiing, snowmobiling or skating with the family. For snowy adventures, ski at Loon with free shuttle service for weekends and holiday, or drive to Cannon Mountain, just a fifteen-minute trip away. Snowmobile trips, cross country skiing, and snowshoeing are other fun wintertime activities. During the summer, enjoy the swimming pond with a sandy beach or play a friendly game of basketball or tennis. Get outside and hike the Appalachian Trail from Lincoln Woods, zip-line at Alpine Adventures or ride the gondola up Loon Mountain for a stunning view. Other close-by New Hampshire attractions just minutes away include Clark's Trading Post, Whale's Tale Waterpark, The Flume, The Basin, and Cannon Mountain tram rides. Take a scenic drive to Conway over the Kancamagus highway. Pets allowed with the owners’ approval. The condo allows up to six adults or families of eight. No smoking in the unit or within 200 feet of building is permissible. 8 Passes to Community/Sports Center with Pools, Hot Tub, Sauna, Game Room, Great Room, Racketball, Video Room Basketball, Tennis Courts and Swimming Pond. Everyone that I worked with in person and on the phone were extremely friendly! Rent this unit! If you are looking for a quintessential ski cabin experience, look no further. The location of this unit is superb, probably less than a 10 minute drive door-to-door from Loon Mountain. Less than 10 minutes to downtown Lincoln and all it has to offer, and less than 10 minutes to Woodstock and the restaurants there too. Really the perfect location as far as we were concerned. In addition, I would assume we are not the only family that has members that don't love to ski ALL the time. The fact that this unit comes with access to the community center with a pool, hot tub, and other amenities had us in love. To the point I would buy this place in a heartbeat if it were for sale. This unit is in a condo complex. It is on the bottom floor (there is a unit above you) and behind this unit is the Pemigewasset River which just adds to the experience and makes me love the place that much more. I really can't overstate how perfect the location is for this unit, especially for what we are looking for! However, we arrived after work on a Friday for a long Holiday Weekend, and it was impossible to find the first time, as EVERYTHING looks the exact same and it was dark. It took us 25 minutes to find it! Inside the unit was very clean. It has one bedroom with a queen bed, one bedroom with two sets of bunk beds (sleeps 4), and one master bedroom with a queen bed with a full bathroom attached with a tub. There is another full bathroom between the other two bedrooms as well. It has a great, large living room and a fairly open layout between the kitchen, dining room, and living room. The living room has a real, working, wood-burning fireplace that you are free to use and came with PLENTY of firewood under the stairs outside. Off the living room there is a small covered deck with a charcoal grill overlooking the river. The only complaint here is there is really no lighting on the deck, so grilling at night with no light made it a challenge. There is also a stacked washer/dryer in a closet by the master bedroom. Lastly, there is a mud room/breezeway that is perfect for skiing so you can unload all your snow-covered gear and keep it fairly warm, but not destroy the inside of the unit. The unit is dated, having not really been updated (furniture, decor, kitchen, etc) since it was built, and I'm guessing that was the 80s-90s. It appeared this unit had newer carpet throughout that was nice and soft. In addition, the windows are apparently old as they had clear plastic covering all of them to help with heat retention. I get it that it gets super cold, but it just gave a feel the place needs some TLC.